Why Jaguar's latest super sedan is so much more than just a distraction project to keep the SVO division entertained. Shorter attention spans may not remember the day when Jaguar was on its knees, having endured a near death experience before being bought out by Ford and accepting a life of mediocrity. That was all before a flood of cash came its after Tata Motors took JLR under its wing. The ambitious Indian automaker had big plans for the marquee, hopeful to put it on par with Germany’s luxury giants. Jaguar is still a ways off from reaching that goal, but the XE SV Project 8 is a sign that it’s closer than ever. It's obvious that Jaguar is still dipping its toes into the water inhabited by Mercedes and BMW. Its latest crack at the two, the XE SV Project 8, will only see 300 units cautiously go on sale worldwide. It’s a Costco-sized sample at best, but the fact that Jaguar chose the base XE as the foundation for such a special car indicates where those crazy Brits are aiming their crosshairs. Namely, straight at BMW’s M Division and Mercedes’ AMG outfit. In either competitor’s lineup, buyers have to float up to the mid-range M5 or AMG E63 to get anywhere near the amount of power offered by the Project 8, but Jaguar threw all 592 horsepower under the hood of its lowly 3 Series and C-Class fighter to send a message. In a sense, it beat AMG to a C63 Black Series and marked its territory on the M4 GTS without the help of a fancy water injection system. It's all to send a message to the Germans saying that the SVO division has what it takes to do battle at the same level, if only the bean counters were more forgiving. The real kicker here is that it may not be too long until we see that day come. The F-Pace has already propelled Jaguar to new heights that it hasn’t seen for some time and analysts predict the automaker's future to be even brighter. 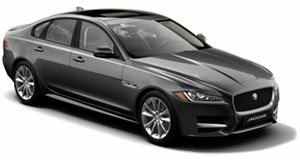 Unlike Maserati, Jaguar already has the coupes and sedans it needs to retain the image of a sports car company while letting the F-Pace do the grunt work of invading driveways across the US. And reinforcements are coming. If Lexus was able to match Mercedes' and BMW's sales numbers with the small NX crossover, imagine how a beautiful and inexpensive E-Pace will shake things up. Oh and don't worry about BMW’s i Division or Mercedes’ batch of EQ models either. Not only will the I-Pace serve as the ambassador telling us how Jaguar will cope with the demand for alternative energy sources, but it will be a testbed for the technology and design philosophy we’ll soon see on electrified Jags of the future. Once Jaguar’s average fleet fuel economy is low and its pockets fat, the time will come for the performance models to fortify the forward charge and beat the competition where the results are most apparent: on the race track. Still, it’s important to look at why Jaguar chose to hype up the XE because it could have made a special edition out of any of its cars. A more powerful F-Pace would certainly be welcomed by the masses and an XF with the same engine tune and track hardware could shame the latest batch of AMG E63s and M5s by being just as advanced, but instead Jaguar decided to hang back and fight in a niche that’s not yet been touched by the Germans. Again, it’s all to send a message. Jaguar still needs to gather steam before it can see eye to eye with the German sedan powerhouses, but SVO wants them to know that it’s just as ready, even more angry, and held back by nothing more than bean counters waiting for a stronger foundation before firing off the starter gun.